I have long known Jim to be one of the most laid back, unassuming, modest players – and I do mean virtuosos – I have ever met. Though this is only the second time I have met him in person, I knew he would fit right in with our Gathering crowd, and that the attendees and audiences would appreciate him as much as I do. He first did an hour segment on Saturday for the registered attendees, re-capping (in a long and winding nutshell) both his life and musical path. This took us bouncing across the world, from Alaska to Mexico, from Spain to London, the Canary Islands, and then back and forth from there to France, as he now lives. Amazingly (as his story unfolded), he managed to find a new and wonderful (and laid back) way out of every seemingly dire situation. 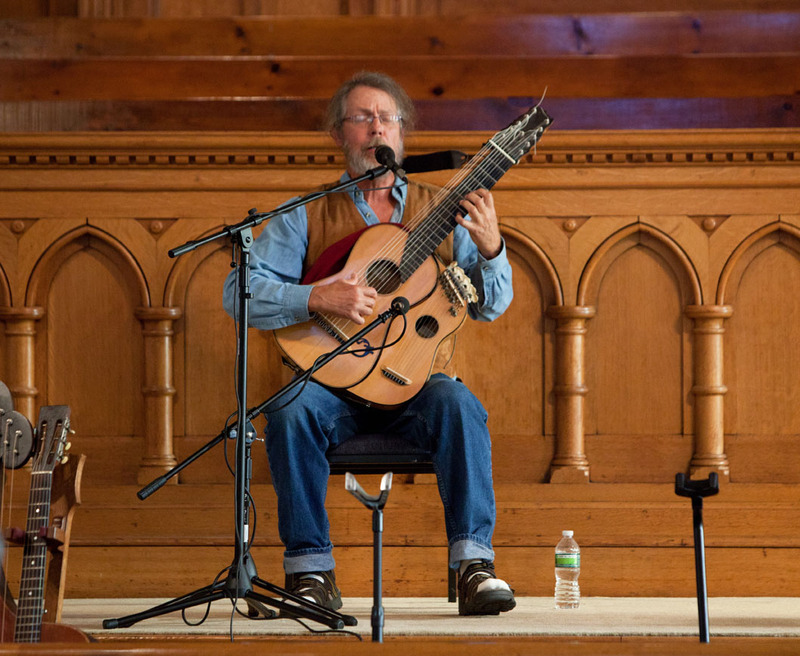 He retains his classical chops (from an early scholarship in Spain), and applies them effortlessly to both the 11-string arch guitar and super-treble harp portions of his remarkable instrument (built by Alan Perlman). 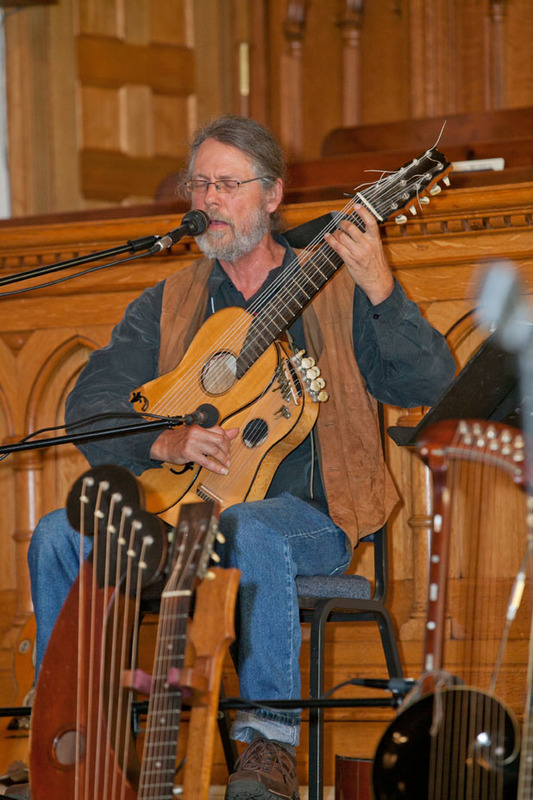 The separate harp body – which he removed and strapped back on for us in about 30 seconds – was an idea when his duo partner (nyckelharpa player Mariusz Radwanski) suggested that they needed “a harpist, and vocals.” Jim also then began singing and writing beautiful poems and songs, several of which he played during his segment and the two later concerts. More amazing perhaps than the surprisingly resonant and balanced sound of the harp section against the 11-string arch-guitar portion (using only one microphone) was the volume and tone produced by his left hand tapping out the neck notes while the right played harp-like melodies. He insists it is nothing remarkable, and simply because his instrument “is really easy to play.” Nevertheless, the instrument sounded glorious, as did his performances. I hope those attending managed to pick up some of his always-popular CDs. 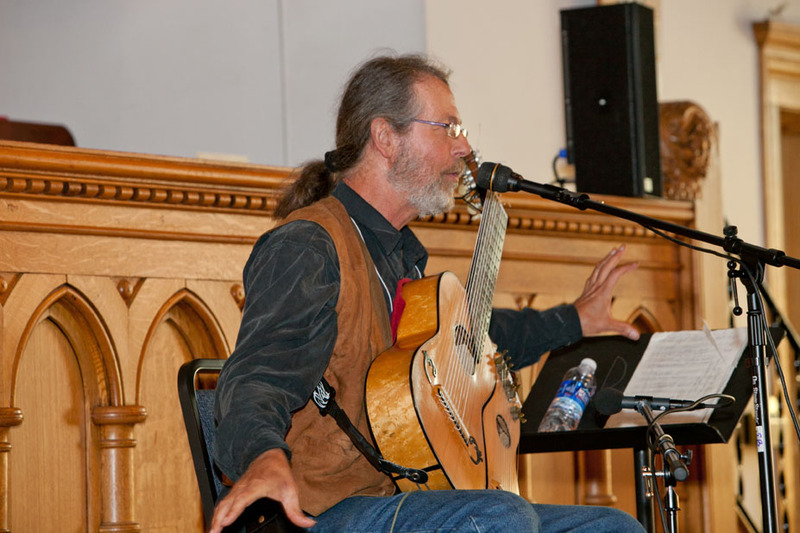 Personally, I’m thrilled to have been able to include Jim (with a tour de force original piece) on our recent Further Beyond Six Strings CD. (You may remember that he was on the original Beyond Six Strings CD as well!) 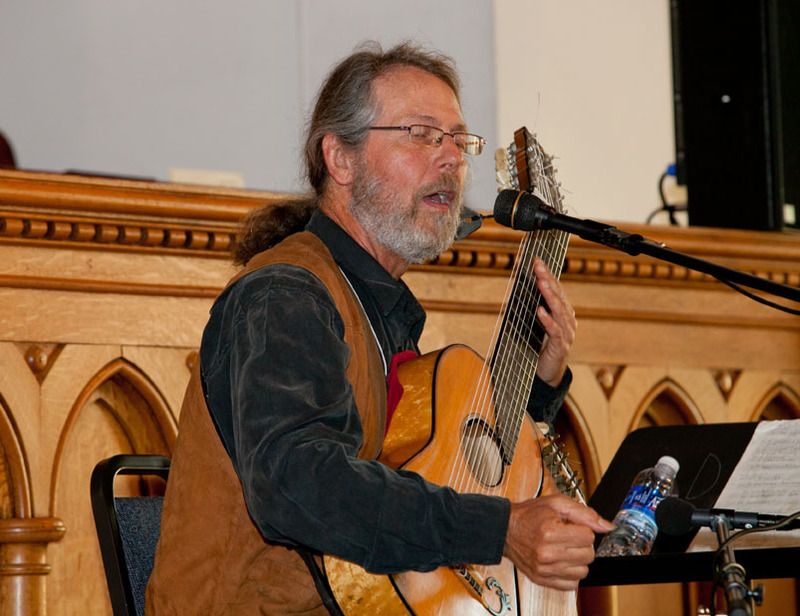 And just wait til you hear his contribution to the upcoming Christmas harp guitar compilation (which we arranged as a duo for his arch-harp-guitar and my harp-mandolin). I hope we get a chance to see more of the talented James Kline in the future. I really enjoyed meeting you, listening to your stories & the music of your life. You have enriched us all by your presence here. Always thought you were a musical musician with the strings: enjoy all of your recordings! Fondly, Jennifer Gorgas a.k.a. L.B.J.